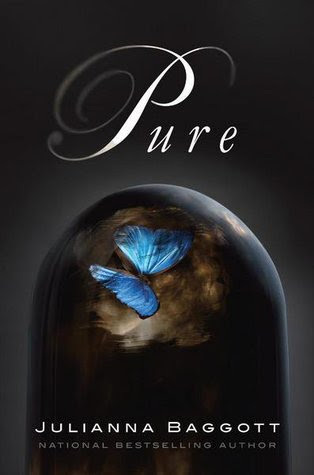 Pure [Audiobook Review] – my books. my life. Pressia survived the detonations 9 years ago. But she is not left without scars. As her 16th birthday approaches, she prepares to live in hiding with her grandfather rather than turn herself over to the militia as required. Partridge is a Pure. He has lived in a dome since before the detonations and bears no scars. But he wants out. Pressia and Partridges worlds are about to collide. With the two worlds – the one inside the dome and the one outside – this may actually be both post-apocalyptic and dystopian, but this book is all grit. Pure takes place only 9 years after the apocalyptic event, which makes it unique. The main characters have memories (however vague) of the Before and of the Detonations. I thought this was an interesting storytelling perspective. I had a lot of issues with the story. The science, for one. The fact that these kids couldn’t remember what life was like when they were 7 (I clearly remember the home I lived in and the school I went to when I was 5 and 6). The coincidences. I just didn’t BUY a lot of it. This was a book club pick, but actually seemed like a book I would read anyway. However, I don’t think I’ll be continuing with this series. Someone tell me how it ends. I had already fallen in love with Khristine Hvam earlier this year. Joshua Swanson wasn’t quite up to her level, but he reminded me a bit of Wil Wheaton and we all know I love his narration. The remaining two narrators had smaller roles. The plethora of narrators made the book someone inconsistent, especially where they were reading the dialogue of the other characters. I think this would have been better with one narrator. Many of these YA dystopians sound the same to me. I think I’m waiting for something really unique before picking up another one. Sorry this book didn’t work for you! Too bad. I loved this series. Yes, there were a few flaws, but I thought the character development (especially later on) and concept were both great.